Why go in February: The frenzy of Sundance is over, and believe it or not, there are plenty of cheap thrills in Utah’s glitziest mountain town. Steal for skiers: Stop by Salt Lake’s Utah Ski & Golf (801/355-9088) for 10% to 20% off lift tickets at all Park City and SLC area resorts. Best deal for out-of-staters: Ski free the day you fly into Salt Lake through the QuickStart program (Feb 1–12; register at ). Catch a free ride: Park City buses will drop you at the base of each resort (download a schedule at ). Or grab a lift: Hop on the town ski lift―right on Main Street―to go straight to the top of (lift ticket required, $85). Did you hear? The state’s “private club” laws are history, which means you don’t have to plonk down a membership fee to grab a drink at bars. Get a history lesson: Check out the newly redone ($10; 528 Main St) to drill for silver in a simulated mine or belly up to the bar at a saloon. 1. A free scenic snow day: If downhill prices seem too steep, slip on snowshoes and head out for a snowy hike on more than 12 miles of free groomed trails that loop around town. Matt’s Flat and Round Valley Loop trails are great scenic options. retail shop (1790 Bonanza Dr.) can set you up with maps and snowshoes for $15. 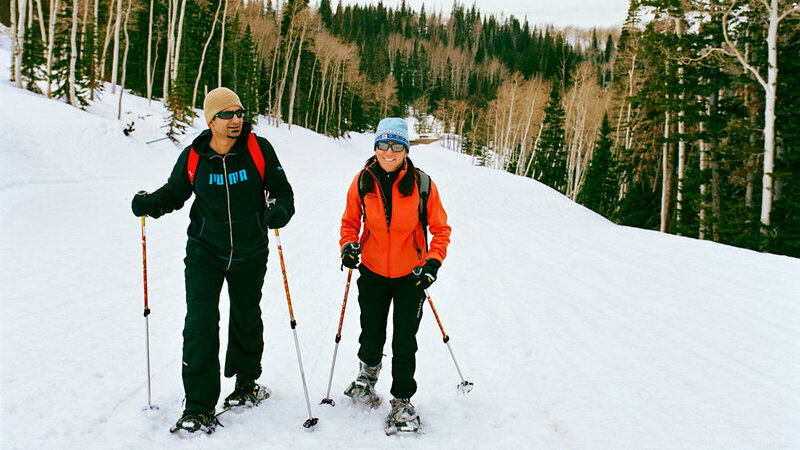 Or rent nordic skis for $16 at the trailside White Pine Nordic Touring Center (at Hotel Park City, 2001 Park Ave.; 435/649-6249) and join a guided tour. 2. See Park City’s artsy side: Not all ski towns have sophisticated museums, so the is a noteworthy surprise―and it’s free. Local artists teach workshops in every­thing from silversmithing to digital photography. Learn to throw a pot or knit a wool cap during a one-day workshop (around $50) or at drop-in studios ($10 plus materials). 638 Park Ave.
3. Dodge the bullet of a high-priced lunch: For lunch under $8, make a beeline to El Chubasco Mexican Grill and its outstanding fish tacos, dozen fresh salsas, tamales, mole poblano, and, if you’re feeling adventurous, birria, a spicy goat stew. $; 1890 Bonanza Dr.; 435/645-9114. 4. Ski in for spirits and small plates: Snowplow into the new High West “gastro-distillery” from Park City Mountain Resort’s aptly named Quittin’ Time run. Take a tour of the distillery, in a 100-year-old stable, then dine on a raclette of local cheese or elk with rose hips or berries. Our fave pairing: small plates and Rendezvous Rye whiskey. $$$; 703 Park Ave.; 435/649-8300. 5. Downward dog on a budget: Try an exhilarating―and inexpensive―yoga class at the , housed in a historic brick building that was once the machine shop for the town school. The best part is that you pay what you wish (locals pay about $10 per class). 1167 Woodside Ave.